Published on February 5, 2010 in Bands/Artists, Eastern Iowa, Music, Out and About and Upcoming Show. 0 Comments Tags: Ben Schmidt, CD release, Cedar Rapids, csps, Dustin Busch, java blend, legion arts, Live, Silt. 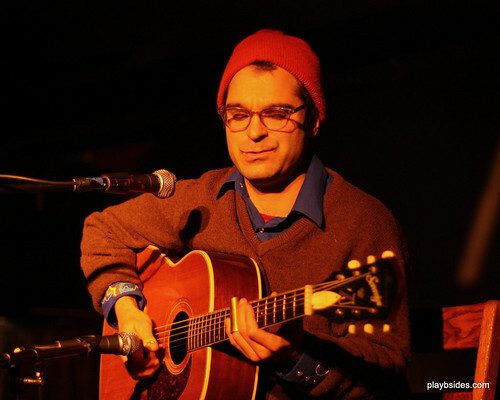 Iowa City musician Ben Schmidt has been on the Eastern Iowa scene for a while, releasing two critically-acclaimed self-released albums– Write It Down in 2002 and While You Were Sleeping in 2005. His press releases draw accurate comparisons to John Gorka, Jesse Winchester, Kelly Joe Phelps and Leonard Cohen. Ben is releasing a new album titled Silt which draws its inspiration from post-flood experience– the songs are from the perspective of people who have experienced personal “storms” — physical, emotional and spiritual and what remains when those waters subside. 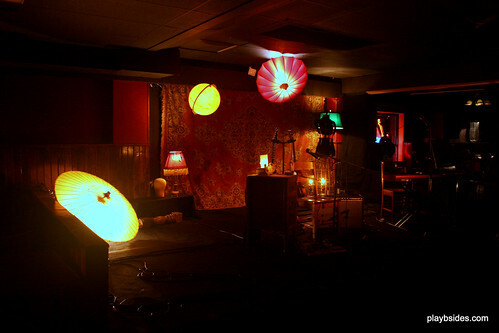 The album is pretty much a one-man affair with Ben recording vocals, guitars, bass, drums and electric piano. Assisting one the album is Nate “The Count” Basinger from the Diplomats of Solid Sound on organ, piano and accordion, Steve “The Chief” Hayes on drums, Lori Lane on harmony vocals and Larry Mossman on mandolin. I’ve had the opportunity to listen to Silt, and I found myself focusing on his lyrics. Ben is a masterful storyteller and his deep, smooth voice provides the perfect narrative match. His style recalls some of the great classic singer-songwriters and anyone who is a fan of Lightfoot, Croche and Taylor should find Schmidt a complimentary listen. To gear up for the promotion of Silt, Ben along with Larry Mossman are taping a Java Blend show with Ben Kieffer today (2/5) at the Washington St. Java House in Iowa City which will be aired on Friday 2/26 and Saturday 2/27 on Iowa Public Radio. Ben will also be performing a show at CSPS in Cedar Rapids on Saturday 2/6 as a CD release show. Ben will be joined by Dustin Busch on guitar, Steve Hayes on drums, Lori Lane and Larry Mossman on mandolin. 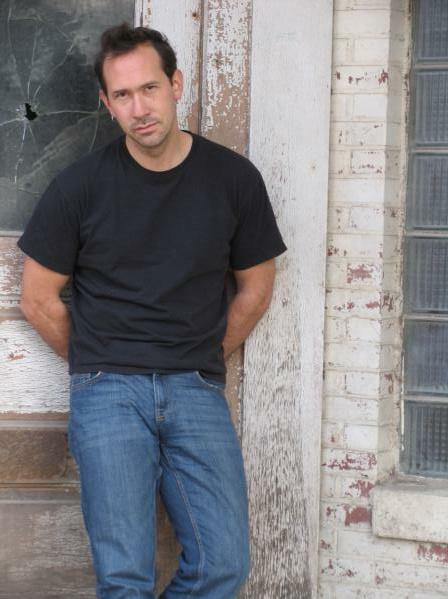 Dustin Busch will be opening the show with his hill country blues-influenced music. Doors will be at 8PM and tickets are $11 in advance and $15 at the door and available through IowaTix. Click Here for the details of the CSPS show. Click Here for Ben Schmidt’s MySpace Page. Published on January 3, 2010 in Bands/Artists, Eastern Iowa, Media, Music, Out and About, Personal History and Reviews. 0 Comments Tags: Bo Ramsey, Dustin Busch, Heaven & Earth, Iowa City, Jon Penner, Pieta Brown, Sandy Dyas, Steve Hayes, The Mill Restaurant, This Land Is Your Music. Thursday night, November 19th, was the last of the three shows that comprised Pieta Brown‘s Artist-in-Residence at the Mill Restaurant in Iowa City. Each show had different opening acts and gallery exhibits, and Pieta used these shows to try out different performance configurations. The first show was a solo acoustic show, the second was a duo show with Bo Ramsey, and this show was a full-band show. The band, dubbed “Skyrocket” was Bo Ramsey on guitar, Steve Hayes on drums and Jon Penner on bass. Effectively this her “Dream #9” band with a swap of drummers from Jim Viner to Hayes. The opening act was Dustin Busch, whose photographs were in the gallery and who joined Pieta on stage as well for the first show. 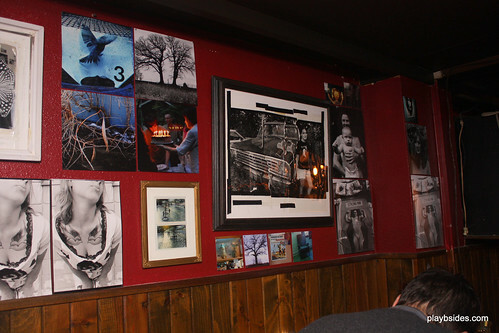 The gallery for this show was an installation of Sandy Dyas’s photographs. I was looking forward to this show because I really enjoyed seeing Pieta with a full band back in June and this is as close to her records as she can sound live. I think she has really come into her own as a songwriter, musician and performer since her self-titled debut in 2002. Certainly her solo, duo and trio performances are the style that is associated with her, but fronting a band on stage is a new mode for her, and one I hope to see more of because, frankly, I like the drive of the drums behind her songs. Talking to her after the show about it, I get the idea that she doesn’t want to put too much focus on the full-band configuration over the other forms. She isn’t going to tour the full band, I’d say– if only because of the complicated logistics and economics of touring a full band. Dustin Busch aka “Dusty B” opened the show with a solo acoustic set. Dustin’s set was comprised of covers and original songs which showcased his “hill-country” blues style. Dustin’s amazing slide guitar style was coupled with a characteristicly mush-mouthed vocal delivery which reminded me of R.L. Burnside or T-Model Ford. 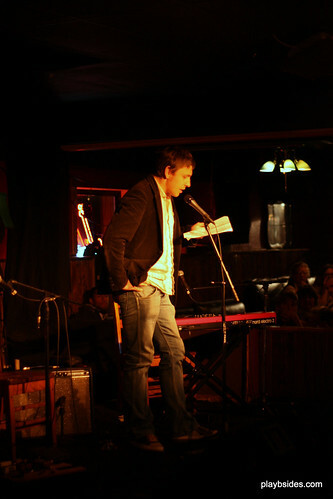 He had a microphone pointed at his feet so that his foot stomping could be picked up. I was really impressed with the set– I’d like to see him play again sometime when he’s in the area. I had a great conversation with him after the show about old blues artists– its clear his passion is in this as he possesses a pretty encyclopedic knowledge of this topic. I could have talked to him for hours! I managed to capture his set-closer which was an instrumental cover of Al Murphy’s “Quail is a Pretty Bird” with my iPhone which you can see below. This song is typically a fiddle tune, but Dustin transforms it for guitar. 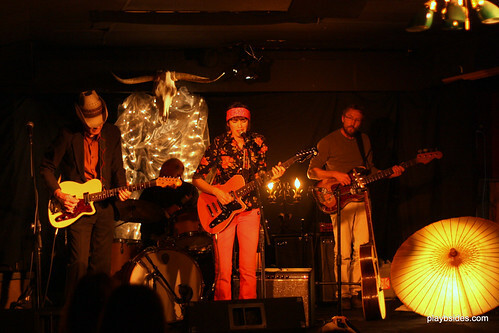 Because the stage was occupied by more people, it left less room for the neat stage props, so Stan Crocker created a new set incorporating some of the original props, but included a steer skull and an interesting blanket of lights you can see in the above picture. I wish I would have gotten a wide-angle shot without the band– it was really cool. Pieta brought out her new Reverend Flatroc electric in Rock Orange, although in these pictures under the red lights it appears that the guitar matches the pink in Pieta’s outfit. She was playing it through a Fender Silverfaced Twin Reverb, which according to an interview with Nick Stika I read with Bo Ramsey in Premier Guitar, is actually modded to a blackface circuitry. This means that it is a later Fender tube-based amp from the CBS period, but has been modified to the same circuitry a pre-CBS “blackface” spec. 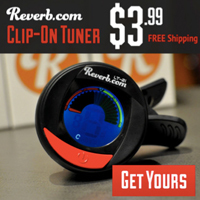 (sorry about the guitar gear geek stuff…). The set was great, and included a run of songs that were very suited to the full-band experience. It was pretty evident that the Bo/Steve/Jon backing band was a good choice– they play together very frequently and it shows how easily they can be dropped into a setting like this. The crowd started warming up to the band and some people started dancing. I’ve said it before– I really like hearing Pieta with a full band– the energy is palpable and infectious. Pieta was her typical humble and gracious self– thanking people for coming out and thanking the Mill for letting her try her “experiment” and stated that she hoped to be able to do this again. This show’s art exhibit was one that I was really looking forward to– the Sandy Dyas installation. She utilized the backroom to its fullest with a sort of “mini” installation of her “Heaven & Earth” exhibit which will open at Simpson College in Indianola, IA on January 11th and will run through February 5th. She is using the walls as a larger canvas– if you will– where she is hanging photographs in groupings in relation to each other– the juxtaposition of which offers an interpretation of the subjects wider than the individual photos. Graphic arts is about the use of space, and this exhibit will be an interesting and compelling exercise. 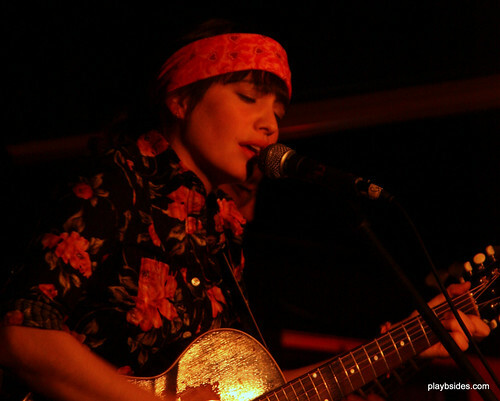 After it was all said and done, these shows accomplished what Pieta set out to do– she got an opportunity to work out some of her material in different stage settings– a sort of warm-up to the touring she will be doing in support of her Shimmer EP and the upcoming full length this year on Red House. She also used these shows as a way to show the community of artists that exists in Eastern Iowa. I moved back to Eastern Iowa to follow a career opportunity, but I was also very excited to come back to the area to see the music and arts scene I grew up around. I hope that Pieta attempts another series of shows like this– there are a lot more artists and musicians who could benefit from the exposure Pieta could bring to them in this setting. Click Here to see my full flickr set of pictures from the show. Published on November 7, 2009 in Bands/Artists, Eastern Iowa, Music, Out and About, Reviews and Upcoming Show. 0 Comments Tags: Alex Ramsey, Dustin Busch, IA, Iowa City, Live, Pieta Brown, Shimmer, The Mill Restaurant, This Land Is Your Music, Upcoming Show, Zoe Brown. In the middle of her solo performance at The Mill in Iowa City Thursday night, Pieta said to the small crowd, “It’s like I’m playing to you in my living room!” Pieta was referring to the small crowd on Thursday night, but the stage was adorned with a chair and nightstand as well as lamps and an old dress form giving the stage a homey touch with lighting designed by Stan Crocker, who has done a lot of lighting design for TV shows like CMT’s Crossroads. 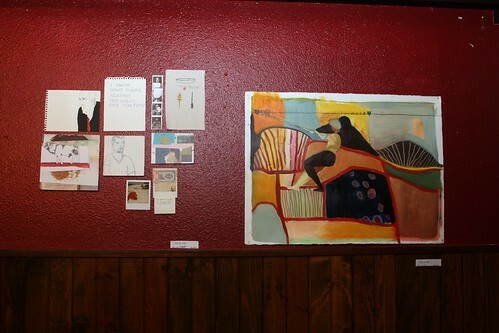 Last night was the first night of a three-week artist-in-residency at the Mill Restaurant in Iowa City of Pieta Brown. 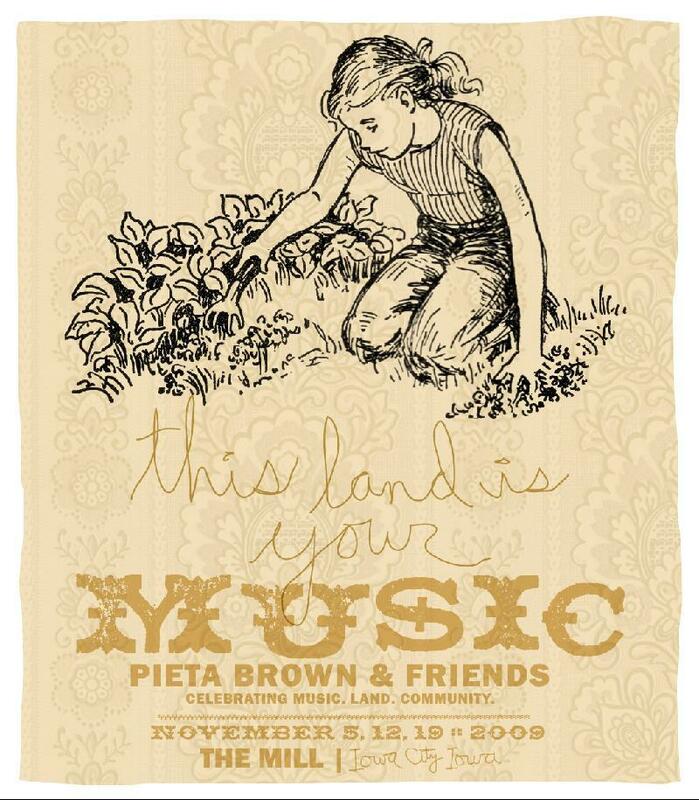 As stated earlier, the This Land Is Your Music series is showcasing Pieta Brown’s music but also includes other musicians from the area as well as other artists. 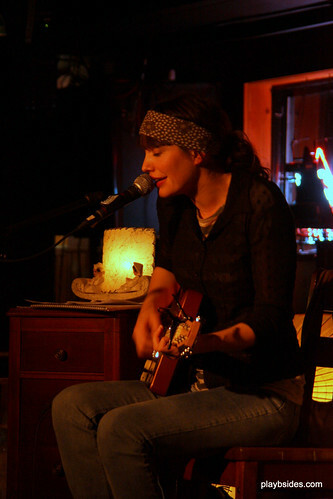 Pieta stated in an interview with Ben Kieffer on IPR’s The Exchange that she wanted to take the opportunity to try out her music– new music and old in different configurations– solo, duo and full-band. She feels that The Mill was is a good place for her to try out new material which will be drawn from her new EP on Red House Shimmer, as well as songs that she is recording for her next full-length to come out next spring. Last night’s show featured Pieta performing solo with Bo Ramsey’s son Alex Ramsey opening. In the back-room gallery the art of Pieta’s sister Zoe Brown and photographs by Dustin Busch were on exhibit. A last-minute addition to the lineup were three writers from the University of Iowa International Writing Program reading their short stories. Alex Ramsey has contributed his keyboard skills to a number of Eastern Iowa music releases including a two records from the Pines as well as the last couple of Bo Ramsey albums but to date he hasn’t had much exposure as a solo artist. I made the very incorrect assumption that Alex, like his brother Benson would provide a sound that draws from the folk and country blues that is identified with so many artists from our area. Alex played a set of original piano-driven music that reminded me at times of Radiohead’s piano-focused songs but I would also compare it to the late Epic Soundtracks. It’s the slightly off-kilter but soulful vocal combined with the piano that brought me back to 1991’s Rise Above. 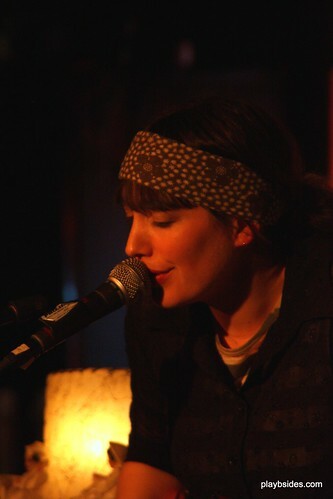 Alex’s set was a combination of vocal and instrumental songs– most of which were described as works-in-progress. 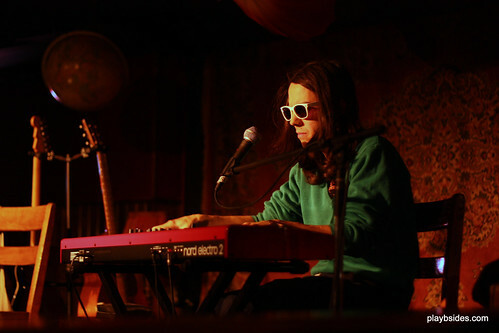 Alex performed three covers– one by Dr. Dog– “Livin’ A Dream,” a relatively obscure John Lennon track “Mr. Hyde’s Gone (Don’t Be Afraid)” which I think is only included on the Anthology box as a home demo, and he wrapped up his set with “Waltz (Better Than Fine)” by Fiona Apple. He said during the show that he wished he had a CD he could sell us– I do, too! Following Alex was three participants in the International Writing Program reading their own short stories. I wasn’t able to catch their names, but one of them was Maxine Case from South Africa who read her short story “Homing Pigeons” (exerpt here). Another writer was Garcia Groyon from the Philippines. I can’t identify the first writer from the pictures. I think it was pretty cool that they were able to participate– it reminded me of the incredible resource the U of I writing program is. The set was a pretty good mix recent songs, older songs and new songs as she set out to do. Curiously, she only did one song from her upcoming EP Shimmer– “You’re My Lover Now”– which seems to be the “single” if there was one. Of course, the Shimmer songs were recorded back in March and she said that she just got back from recording songs for her full length, so possibly these are fresher to her. She told me that she doesn’t really hit the stage with a setlist in mind. Three of the songs were from her self-released Flight Time EP with just one track from Remember the Sun and her arrangement of the traditional “Little Sparrow” from her I Never Told EP. She dropped in her version of the blues standard “Rollin’ and Tumblin'” and “Calling All Angels” which she did as part of her KCRW session back in 2007. We were blessed with some new songs that all sound like they have some potential in the studio. “The Other Way Around” and “It Wasn’t That” were new songs to me. She also did “Faller” which I had heard when she did her show at the Mill with a full band back in June. After the first nine songs she decided to invite her sister Constie Brown up to sing on “Remember the Sun” and “Just” and then she invited Dustin Busch up to the stage to provide some slide guitar to “Rollin’ and Tumblin'” and “Harry’s Blues.” Pieta said that her original plan was to play all of the instruments she had on stage by herself as she handed Dustin the Flatroc and a slide. She added that growing up music was always about getting people together to play. Dustin quickly adapted to the guitar and provided some nice accompaniment to Pieta. I’m looking forward to seeing his opening set at the This Land Is Your Music show on 11/19. 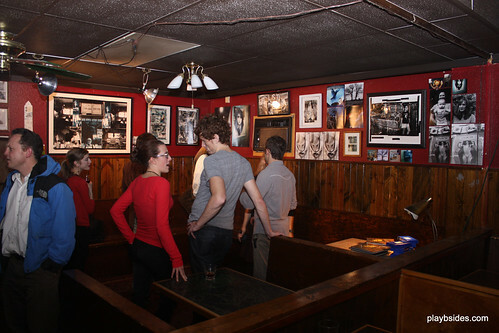 The backroom gallery was the back area of the restaurant that could be closed off and I think is sometimes used as a “backstage” area for bands. In its capacity of art gallery it was able to have some lighting to show the paintings of Zoe Brown and the photos of Dustin Busch. The gallery seemed to enjoy a pretty constant flow of people. I like Zoe’s paintings quite a bit– you can see more of them in my slideshow below or at the flickr.com set. She’s not afraid of big expanses of color. Dustin’s double-exposureish photos were pretty cool, too. I would have liked to see more of them and maybe larger. Ultimately, I think this is a really cool thing that Pieta is trying to put together. The idea is pure– bring the regional art together in celebration and give back. I think in our Internet-enabled era where we find our art and culture on a nearly boundless territory we often forget that there are artists in our own backyard that are worth supporting. If you are available on either of the next two Thursday nights– 11/12 and 11/19– make the effort to come out. These are guaranteed to be loose, fun shows as Pieta considers the Mill to be her home turf. The 11/12 show has Bo Ramsey opening and supporting her in her set with a gallery of Codi Josephson’s work. The 11/19 show will have Dustin Busch opening with Pieta fronting a full band that, billed as “Skyrocket,” I believe will have Jon Penner, Steve Hayes and Al Shares (I think). The gallery on the 19th will be a installation of photographs of Iowa photographer and supporter of the local scene Sandy Dyas. The cover is $10 will proceeds going to support Iowa Public Radio, KCCK, and the Friends of Hickory Hill. Doors are at 7PM with the show starting at 8PM. Click Here to go to The Mill Restaurant Calendar for the details on the show. Click Here to read my review of the 11/12 This Land is Your Music Show. Click Here to read my review of the 11/19 This Land is Your Music Show. Published on October 26, 2009 in Bands/Artists, Eastern Iowa, Media, Music, Out and About and Upcoming Show. 0 Comments Tags: Alex Ramsey, Bo Ramsey, Codi Josephson, Dustin Busch, Iowa City, KCCK, KUNI, Live, Pieta Brown, Sandy Dyas, The Mill Restaurant, Upcoming Show, Zoe Brown. As previously announced, November brings a special “songwriter in residence” at The Mill in Iowa City by Pieta Brown called “This Land is Your Music : Pieta Brown & Friends” which is a series of three shows on November 5, 12, and 19 which is described as “celebrating Music, Land & Community.” Each of the shows will center around Pieta’s music with her playing in solo, duo (with Bo Ramsey) and in a full band configuration. In addition to her set, there will be an opening act and there will be an exhibit in the “back room” at The Mill featuring the art of a local artist. The shows start at 8PM, and are $10 with the proceeds going to support The Friends of Hickory Hill Park, public radio station KCCK, and public radio station KUNI (which is now part of Iowa Public Radio). 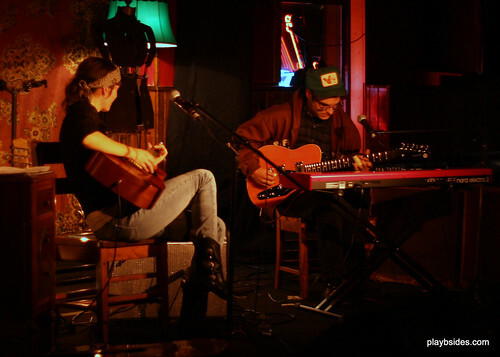 November 5th: Pieta Brown solo with opening act Alex Ramsey. Alex is one of Bo’s sons and brother of Benson Ramsey of The Pines. Alex has provided piano to the last couple of Bo Ramsey releases as well as The Pines. The exhibit will feature artwork by Zoe Brown, who is Pieta’s sister and provided the artwork for Pieta’s last EP Flight Time. The exhibit will also feature art by Dustin Busch. Dustin is an Iowa City stallwart having been playing solo and also part of Kelly Pardekooper’s Devil’s House Band. 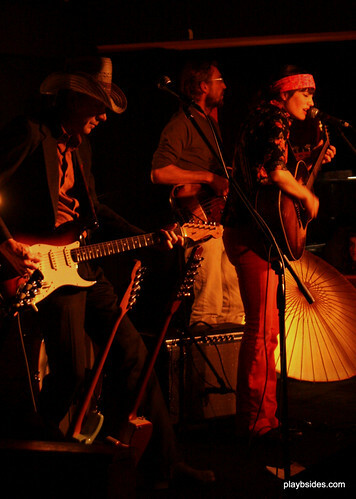 November 12th: Pieta Brown with Bo Ramsey, with Bo Ramsey solo opening. This will be interesting as I’ve never seen Bo as a solo performer. I have a bootleg from a couple of years ago where he was touring with Greg Brown and he opened solo and it was really cool. The exhibit will feature art by Codi Josephson who runs Home-Ec Workshop in Iowa City. This will probably be the CD release show for Pieta’s new EP Shimmer produced by Don Was, which comes out that Tuesday, 11/10. November 19th: Pieta Brown and Skyrocket, with Dusty B. (aka Dustin Busch) opening. Dustin Busch is a former Iowa City musician who is currently the guitarist in the Tucson group The 17th Street Band. The exhibit will be a collage of work by local photographer Sandy Dyas. Sandy’s book “Down to the River” is a collection of pictures of Eastern Iowa musicians including Bo Ramsey, Pieta Brown, Kelly Pardekooper, Greg Brown and others. The book comes with a CD of songs from these artists and is well worth seeking out. Any way you look at this, this is a really cool event and it is wonderful that Pieta is giving back to the community that fostered her career. If you have the opportunity to see any of these shows, by all means, don’t miss it! Click Here to visit the Mill calendar which will have information on how to purchase tickets. Click Here to pre-order Pieta’s new album Shimmer. The Time to play b-sides archives for the dustin-busch tag.